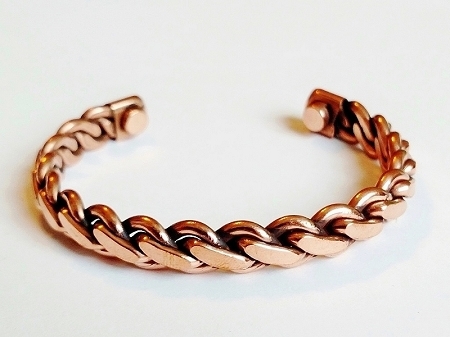 This Cuff Bangle Bracelet is hand-made of pure Copper with tiny magnets attached on both of its tips, and crafted in Twisted Rope Style. ...Since Roman times, COPPER and MAGNETS are believed to be instrumental in affording relief to ARTHRITIS and RHEUMATIC conditions. Regular use of any metal polish will enhance the natural lustre of Pure Copper. 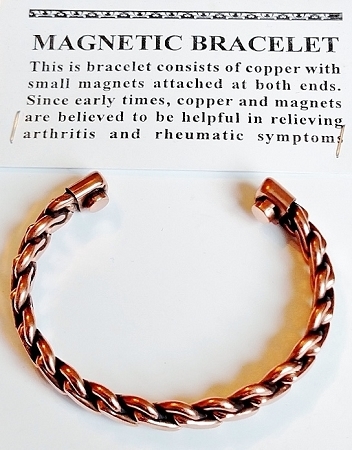 Folklore abounds with stories how copper bracelets for arthritis have been used for centuries in an attempt to relieve joint discomfort and pain. See if it works for You or Your Loved Ones. This Item is not being sold as a medical device and is not intended to diagnose, treat, or cure any disease.